The independent Local Government Boundary Commission for England has opened a new phase of public consultation in its review of Cheshire West and Chester Council’s ward boundaries. 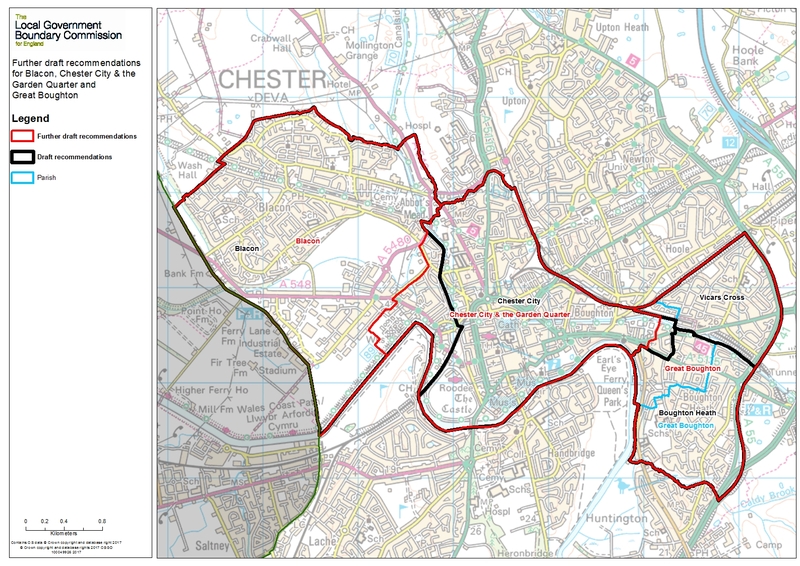 The consultation focuses on new proposals for ward boundaries in Chester. Local people have until 5 February 2018 to have their say on the proposals before the Commission finalises its recommendations for new wards across the whole council area. Earlier this year, the Commission held a public consultation on proposals for new ward boundaries across Cheshire West and Chester. The Commission has listened to the views put to it during consultation and now proposes to make changes to the plans to reflect local evidence. Due to the significance of the proposed changes in Chester, the Commission is opening an extra phase of consultation to see what local people think of the new recommendations. The consultation is limited to the Commission’s new proposals in Chester. Details of the recommendations, including maps of the proposals, are available on the Commission’s website at www.lgbce.org.uk and at https://consultation.lgbce.org.uk/node/9255. The Commission’s draft recommendations had proposed that the Garden Quarter part of Chester should be divided between Blacon ward and Chester City ward. During public consultation, the Commission received strong evidence objecting to the plan. In light of local submissions, it has redrawn the proposals so that the whole of the Garden Quarter would be included in a Chester City & the Garden Quarter ward. The new recommendations would mean Blacon ward would maintain its current boundaries and be represented by three councillors. The Garden Quarter would be wholly contained in a three-councillor Chester City & the Garden Quarter ward. Alongside that ward, the Commission has made further changes to its previous recommendations and now proposes to merge its proposed Vicars Cross and Boughton Heath wards to create a Great Boughton ward which will be represented by two councillors. Professor Colin Mellors, Chair of the Commission, said: “We listened carefully to all the views put to us on new ward boundaries last year and have made changes to the original recommendations in the Chester area. 2. Residents have from 9 January 2018 until 5 February 2018 to have their say about where ward boundaries in Chester should be drawn. The Commission will consider all submissions and aims to publish its final recommendations in March. Once the Commission agrees its final recommendations it will lay a draft order in both Houses of Parliament. Parliament will then have 40 days in which to consider the recommendations. If both Houses are satisfied with the recommendations, the draft order will be ‘made’ and the new wards will come into effect at the council elections in 2019. 3. The Commission is satisfied that it has received sufficient evidence to finalise new ward boundaries for the rest of Cheshire West and Chester and aims to publish a full set of final recommendations for the council in March.